Common stock payout holds steady at $0.78 per share. Data center solutions specialist Digital Realty (NYSE:DLR) said yesterday it will pay a regular quarterly dividend of $0.78 per share on its common stock on June 28 to the holders of record at the close of business on June 14. It also announced dividends for its Series E, F, and G preferred shares to be paid at the same time. Holders of Digital Realty's 6.625% Series F cumulative redeemable preferred stock will receive a dividend of $0.414063 per share while holders of the 6.625% Series F cumulative redeemable preferred stock will receive $0.414063 per share. For investors who hold its 5.875% Series G cumulative redeemable preferred stock, they will get a payout of $0.33455 per share. Digital Realty's last payment on its common stock in March of $0.78 a share was an increase from the $0.73 per share it paid in the fourth quarter of 2012. Digital Realty owns a portfolio of properties located in 32 markets throughout North America, Europe, Asia, and Australia. 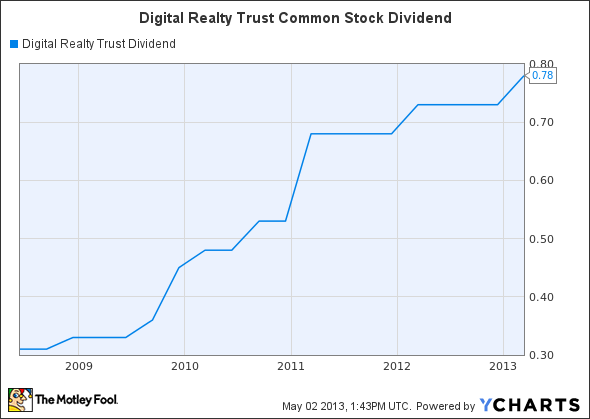 The most recent dividend payment equates to a $3.12-per-share annual dividend yielding 4.5% based on the closing price of Digital Realty Trust's stock on May 1. DLR Dividend data by YCharts.